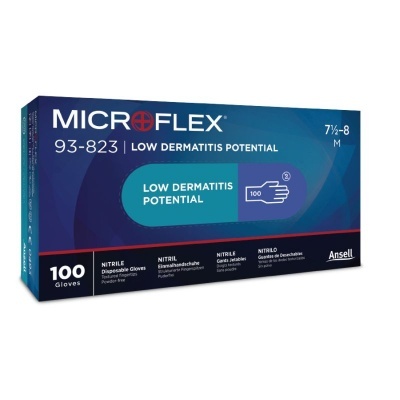 Engineered without the use of chemical additives and accelerators that are known skin irritants, the Ansell Microflex 93-823 Sensitive Skin Disposable Nitrile Gloves are ideal for those who have sensitive skin or are prone to allergic reactions. Made from ultra-soft materials that provide fantastic fit and feel even for long wear periods, these gloves are the ideal way to increase worker productivity and satisfaction. The Ansell Microflex 93-823 are designated Category III gloves, meaning they have a complex design which is intended for the highest levels of risk. The Ansell Microflex 93-823 are available in five different sizes. Please measure the circumference of your hand around the knuckles (excluding the thumb) with your hand open and your fingers together, and the length of your hand from the tip of your middle finger to your wrist.